Mike Fletcher of customer service measures journals prior to working on roller at Fletcher Machinery. LEXINGTON, N.C.—RP Machine Enterprises Inc. has purchased the assets of Butler Rubber Products to give it a strong presence in the silicone covered wheels sector. Butler Rubber's Guntersville, Ala., manufacturing plant, which was established by Sam Butler in 1967, will continue operating for the time being. However, production of its silicone and other products eventually will be moved from the factory to Fletcher Machinery's 100,000-sq.-ft. plant in Lexington, according to Kelvin Gantt, vice president of rubber products for Fletcher, a subsidiary of RP Machine. It has not been determined when the move will take place. "Sam Butler decided to scale back his business after a hurricane hit his plant in early 2012, which allowed him to step back and consider retirement," said Rich Piselli, CEO of Fletcher Machinery. That ultimately led to the sale of Butler Rubber to Fletcher, he said. The transaction closed April 2. Financial details were not released. "The acquisition gives us an opportunity to expand," according to Mark Joel, director of new business for Fletcher, which was acquired by Statesville, N.C.-based RP Machine in 2008. Butler Rubber, an industry leader in the production of high temperature silicone covered wheels, has been manufacturing and re-covering wheels for more than 35 years, he said. The company produces hot foil silicone rolls, hot foiling silicone wheels, thermal heat transfer hot stamping silicone, edge foiling wheels, custom molded hot stamp rubber products and rubber wheels. 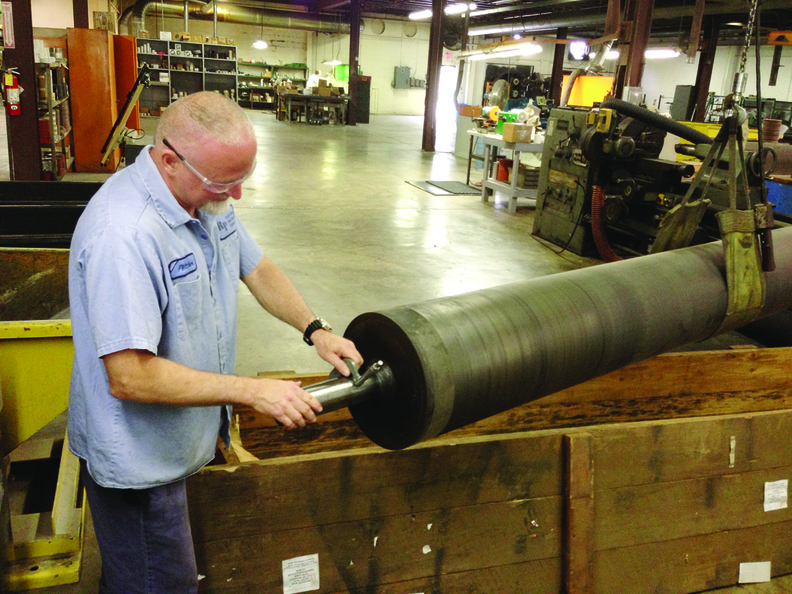 Fletcher offers a wide variety of services, including resurfacing rubber covered rollers, repairing journals and custom fabrication of new wheels and rollers, Gantt said. "We can manufacture rollers up to 26.5 inches in diameter and up to 205 inches long, and we make spiral groove rollers with grooves from 1/8- to 3/8-inch spiral. "We also do crowns or tapers, and we custom-make molds for urethane products." The firm custom manufactures numerous machines and parts for a variety of industries, including printing, woodworking, food processing and off-road/construction at its factory in Lexington, where it has a crew of about 52. The company makes a line of rubber and urethane products that includes feed chain pads, feed wheels for molders, hold down wheels, rollers and pulleys, Gantt said. It uses a variety of elastomers in its products, including neoprene, nitrile, synthetic butadiene rubber, silicone and polyurethane. "Although we are best known for our machinery business, our machine shop capabilities have allowed us to expand our market reach" with the production of components, Joel said. Until a few years ago "we focused primarily on our machines and parts for different industries at our plant," according to Gantt. "Then our component lines—including wheels, rollers and pulleys—took off in the open market, and that end of the business grew." Butler Rubber, which makes products such as gaskets, fits well with Fletcher, he said, because its high temperature silicone rubber is a product that's ideal for the firm's line of offerings. He said that Butler Rubber's products, including its Blue blend, along with wheels, rollers, pads and other goods from Fletcher will be offered to the combined customer base. The merged operation's customers and the entire industry also will be better served by the merged operation, according to Joel. He said that delivery will be faster and capacity will be increased.